One of the initial concerns I had after being diagnosed with Celiac disease over 5 years ago (while in the midst of my college career) was where I would find the snack food and easy meals that are almost synonymous with being a busy student. Boxed mac n’ cheese, cookies, graham crackers, fruit snacks even some salad dressings were all items that for better or worse, I thought I had lost forever. Focusing on cooking with whole foods and reading every ingredient label ultimately made me a more seasoned and experienced cook, but sometimes I still yearned for the “convenient comfort food” as they call it at Annie’s. Being familiar with the brand as a gluten eater, I quickly noticed the growing variety of gluten free products Annie’s sold at my local grocery store and her label soon became a common sight in my pantry and fridge. I’ve selected several products to share with you below, there will be more to come in the future! 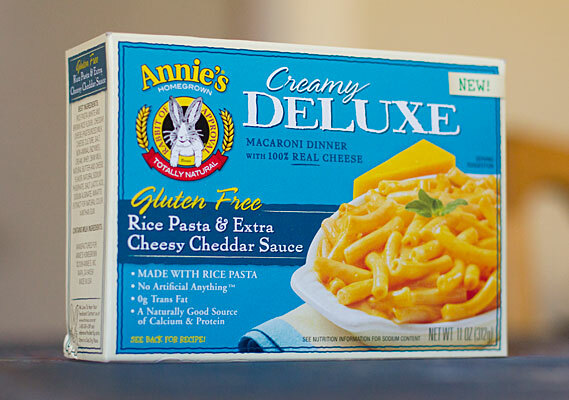 Annie’s Gluten Free Creamy Deluxe Macaroni dinner is by far the best boxed mac ‘n cheese, gluten or no gluten. 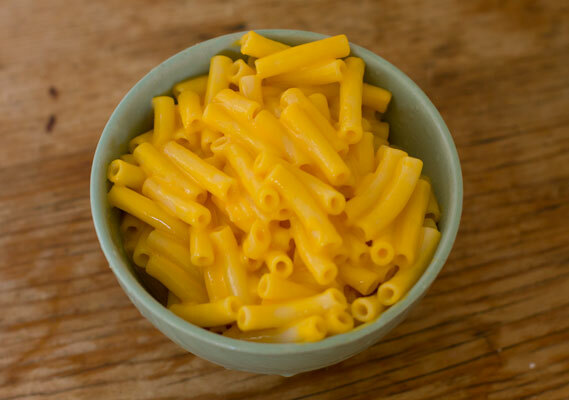 I grew up eating Kraft mac ‘n cheese, and the Annie’s gf version not only boasts all natural ingredients that you can actually pronounce, it tastes better. You don’t have to add any extra ingredients like milk or butter. The gooey cheese you squeeze out of the package is all you’ll need! 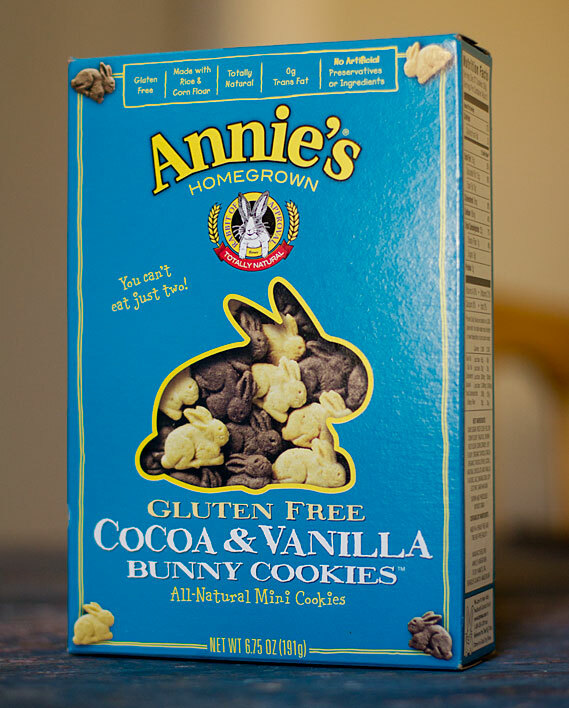 Annie’s Homegrown Gluten Free Coacoa & Vanilla Bunny Cookies are made with rice and corn flour and contain no artificial preservatives or ingredients or GMO’s. The crunchy bunnies are something akin to teddy grahams, they’re a perfect snack for grown-ups, and the cute bunny shapes make them even more ideal for gluten free kids. 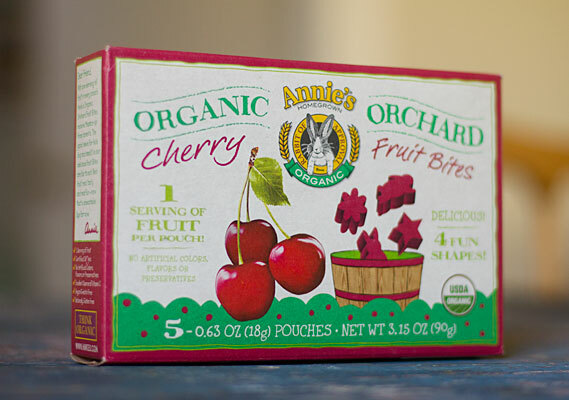 Annie’s Organic Orchard Cherry Fruit Bites are some of the better fruit snacks I’ve tried. Unlike the gummy snacks I ate when I was a kid, there are no artificial colors, flavors or preservatives. When I read the ingredients I was pleasantly surprised that they’re organic and vegan. *Annie’s Homegrown organic and natural products are readily available at grocery stores nationwide. Lauren, I have to say those are some of the most beautiful packaging photographs I’ve ever seen :). Thanks for the kind write-up! I made the four cheese deluxe version last week & added caramelized onions… super rich and good.